This week, the new Tarzan film The Legend of Tarzan is scheduled for its worldwide premiere. While a new Tarzan film used to be a common occurrence (in the 1930s and 1940s there was usually a new one every year), they have not exactly been as common lately. In fact, the latest live action Tarzan film was Tarzan and the Lost City, a pretty bad flick from 1998. 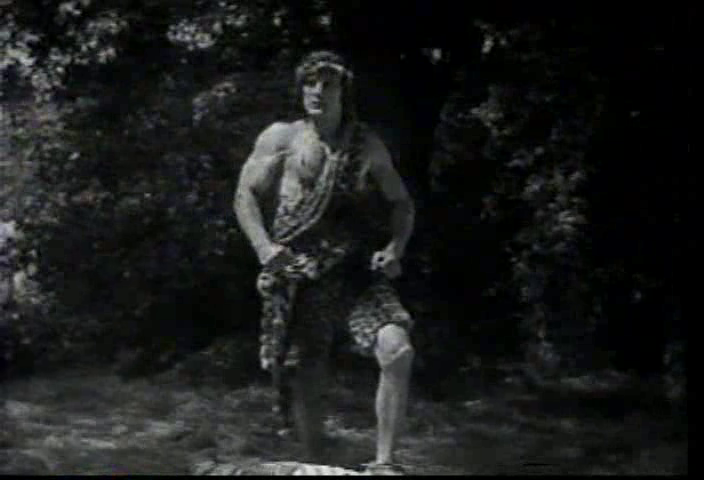 The Internet Archive has a little over half a dozen Tarzan films and serials, but truth be told, most are not good. One of the better is the serial Tarzan the Tiger (episodes 1–7 and 8–15). Tarzan the Tiger was made just as the silent era was swiftly marching towards its own grave. This serial is an example of a blend that was relatively common around this time. It is essentially silent, but it has a synchronized soundtrack, including some (pretty annoying) sound effects and also the first-ever recorded version of the Tarzan yell. It was, however, a far cry (pun intended) from the later Weissmuller version. This was the last silent Tarzan, and it marked the end of the first period of Tarzan films also in another way. Starting with the first Tarzan film, Tarzan of the Apes (1918), Tarzan films had always been based, more or less faithfully, on Edgar Rice Burroughs’ books. But with the first true Tarzan sound film, The Ape Man (1932), the stories were original ones, created directly for the movies. Also, the characters and their surroundings changed from the novels, introducing for example the ape Cheeta (who is not still alive, by the way; that is just a myth) and the famous tree house. But Tarzan the Tiger was still very much rooted in the original Tarzan novels. It has been too long since I read the novel Tarzan and the Jewels of Opar, upon which the serial is based, but my recollection is that the serial follows the original plot fairly well. The traitorous Arnold Werper is there, as is the slave trader Achmet Zek. And most importantly, the jewels of Opar, which everyone wants, and on which the amnesiac Tarzan is positively hung up. If nothing else, the serial is definitely made in the book’s spirit. With that novel, Burroughs started experimenting with a new plot format, one which involves switching from one character’s point-of-view to another’s and with frequent cliff-hangers. I call this type of novel “the jungle romp”, since it has a number of characters running circles in a jungle, alone or in small groups. They are often completely lost, but in the end they miraculously find one another (and the treasure) in just the nick of time. It is plain that this is a formula which would easily lend itself to the serial style of story telling. The Jewels of Opar was also Burroughs’ first novel where he used the amnesia cliché. Many critics have said that Burroughs overused amnesia in his plots: it was used several times in the Tarzan series of novels, for example. But in this first, Burroughs was still experimenting, and it actually helps to lift the story and make it more interesting. Frank Merrill, like so many other screen Tarzans, had a background as an elite athlete. He had been a nationally top-ranking gymnast, and it shows. In terms of physical appearance and ability, he made a splendid ape man. His acting talent was somewhat less splendid, but his over-acting is actually unintentionally funny and helps to raise my level of enjoyment another notch. The version found at the Internet Archive is, unfortunately, very dark and generally of poor quality. I am not sure if restored versions are available on dvd, but all the versions I have seen on the Internet are like this one, or worse. This serial is best enjoyed for an abundance of action and sudden plot twists, just like any good serial. On the other hand, one should not expect too much of the acting or scenography. 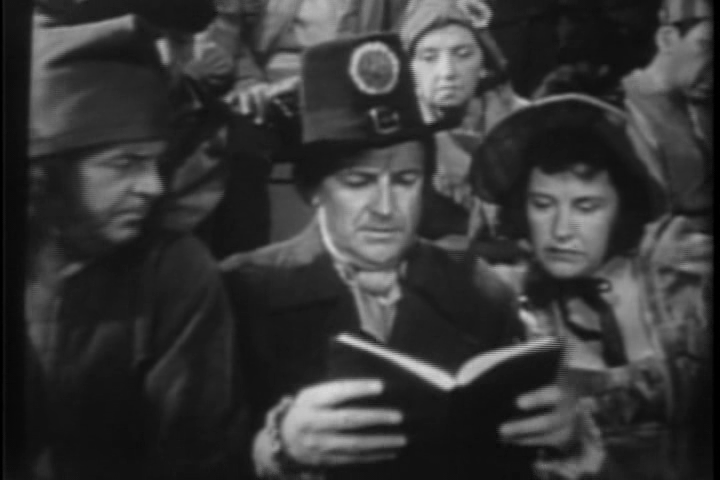 This week’s film is best known as Reign of Terror, and it is so listed at the Internet Archive. However, it was also widely distributed as The Black Book, and it is that title which is used on the actual copy at the archive. The plot of this film is fairly intricate; perhaps at times too much so, as rather too many things are left unexplained or unresolved. D’Aubigny is sent to Paris in order to thwart Robespierre, who is executing his political enemies one by one, as well as some friends, for whom he no longer has any use. Robespierre plans to make himself dictator, but he has lost his Black Book, with the details of those he wishes to execute. It must be found, or all is lost. He gives the mission to judge Duval, but Duval has been killed by D’Aubigny, who now impersonates him. Does this seem a bit overworked? It is only the beginning, and simplified, at that. The actors are all good, and some are excellent. 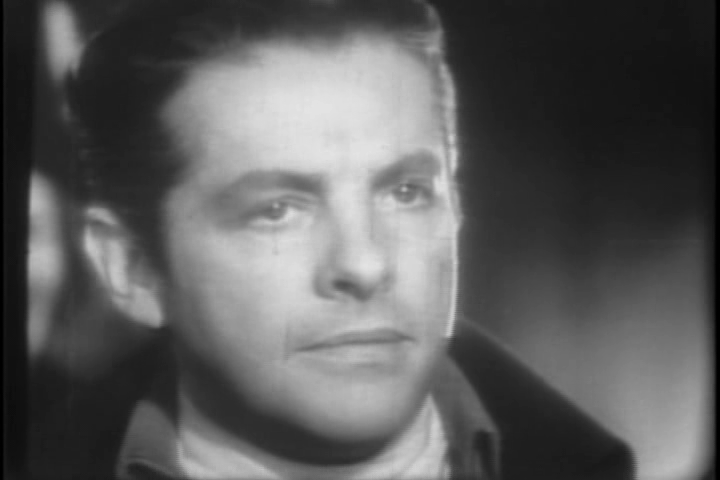 My personal favourite is Arnold Moss as chief of Robespierre’s secret police. Made shortly after World War II, I cannot entirely escape the suspicion that the film may have been partly a political comment on Hitler and Mussolini. The European setting and Robespierre’s greed for power seem to suggest as much. The Black Book was made at the height of the Film Noir movement. It uses much of the typical lighting and camerawork of Noir, and the protagonist is also in many ways your typical cynical and streetwise guy. The historical setting, however, makes this a sort of genre blend, and it is not always classified as a true Noir. This film is best enjoyed as long as one does not try to analyse too much. The story twists along at a good pace and excitement is always kept up. Just sit back and allow yourself to get carried away. If you are like me, you will want to enjoy this visual masterpiece without too many preconceived notions. You will want to stop reading here and skip directly to the download link. But of course, you are welcome to read on. I will not reveal too much about the contents. For all intents and purposes, Samsara is a silent film. Sure, it does have a soundtrack, but that soundtrack does nothing more and nothing less than a good soundtrack for a silent film from the 1920s. There is no spoken dialogue or narration, nor any background sounds that I can remember. The soundtrack rests entirely on the music, partly original music composed for the film. Some of the tracks have lyrics, but those lyrics are not directly related to the images, as far as I can tell. For example, there is a Swedish lullaby early on, but none of the images it accompanies seem to be in any way connected with the theme or the words. And yet, the music works extremely well, producing an almost hypnotic sensation. But the most memorable and powerful aspect of the film is the visual images, filled with vibrant colours. The photography is exquisite, and so is the cutting. The tempo is slow, yet many sudden twists mean that we have time to see images from many different countries and many aspects of both nature and human life. This is a film filled with contrasts. Peacefulness and hostility. Untouched nature and huge cities. Ancient history and modern technology. East and west. Life and death. Religion and … well, I am not sure there is a contrast to religion, but the religious motif is definitely there, and it is very inclusive in the sense that several different religions are represented, and none is shown to be more important than the others. Samsara is, indeed, a turning wheel of life. If it has a weakness, then it is that it tries to say too much. There is not one message in this film, but many, and perhaps that means it is spread just a little bit too thin, sending its energy into many directions at once. But that is a minor quibble, because who said that good art always has to be propagandistic? This film is best enjoyed as cinematic poetry. It can be analyzed and interpreted endlessly, but will it enhance the enjoyment of viewing? I doubt it, though meditating about the many wonderful pictures may give you some insight into the world we live in, or even into your own self. Lon Chaney. That is all that really needs to be said, and the review could end here. But perhaps a few things about the film The Penalty should be added, just for clarity. The plot is actually very interesting, even without Chaney’s magnificent interpretation. A young boy gets both his legs amputated by mistake. As he grows up, unloved and unloving, he gets involved with the criminal underworld, eventually rising to become a minor but ruthless crime lord, nicknamed Blizzard, and with aspirations for greatness. He has many young girls among his underlings, and his favourite gets to pedal his piano (since his handicap prevents him from doing so himself). The police has nothing substantial on him, so they decide to send their best female agent. Meanwhile, Blizzard is planning revenge on the doctor who amputated his legs, and on his beautiful sculptor daughter. Even though it tends to get a bit melodramatic at times, this plot along with the crew’s skillful work are almost enough to raise it to the level of memorable contemporary pieces, such as Das Cabinet des Dr. Caligari, The Mark of Zorro or Klostret i Sendomir. But then along comes Chaney and quite by himself elevates the whole thing to the level of masterpiece. This film is best enjoyed for Chaney’s brilliant acting. He is in total control at every moment. Someone compared him with the Robert De Niro of silent film, and there is some truth in that. Not only because of the acting, but also because of his absolute devotion to each role. 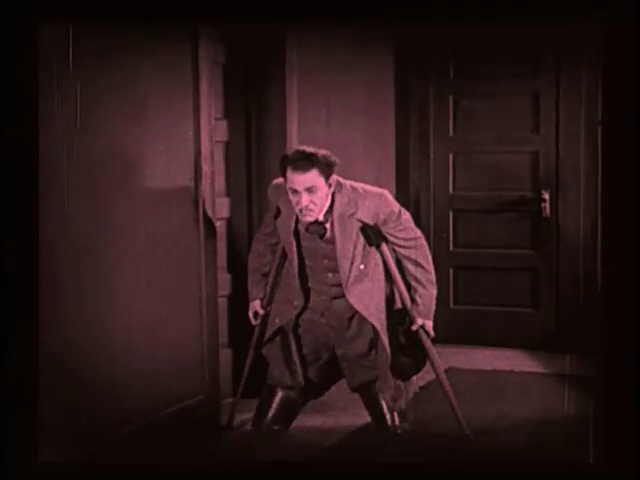 For this film, he built a contraption that tied his legs up so that he looks totally convincingly amputated. It is said that it was so painful that he could only wear it for ten minutes at a stretch, and still the man could act better than most of today’s stars.